Fire pit tables offer reliable warmth, cozy atmosphere and abundant surface space for meals and refreshments. These tables have become increasingly popular in recent years, and now there are styles and sizes for every setting and situation. That means whether you're planning a modern outdoor lounge or a traditional patio dining layout, you can find a fire pit table or complete fire pit table set that's designed to perfectly match your needs and taste. Fire tables can be selected by height, with options that include occasional height (the shortest option), chat height, dining height, counter height and bar height (the tallest option). 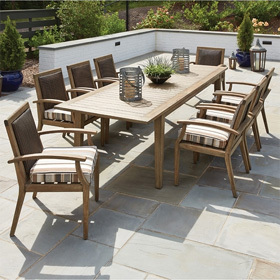 Tables are constructed using the best materials for outdoor performance, such as aluminum, wrought iron and marine grade polymer. Plus, there are a number of table shapes and table top styles in stock (cast aluminum, tile, faux-stone, etc. ), so finding your ideal fire pit table is easy.